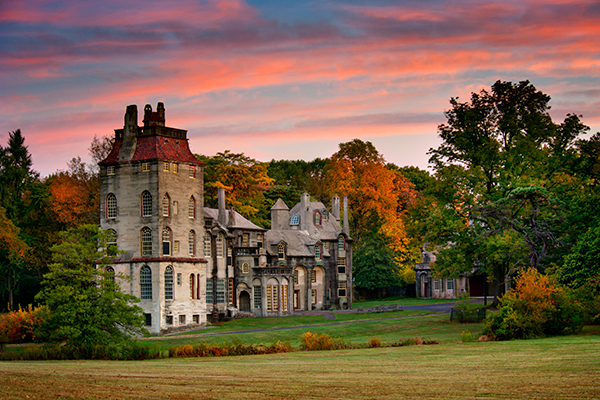 This place is known as Fonthill castle and is located in Doylestown ,Pa.I photographed this amazing location at sunrise recently.Built between 1908-1912, Fonthill was the home of Henry Chapman Mercer (1856-1930). Archaeologist, anthropologist, ceramist, scholar and antiquarian, Mercer built Fonthill both as his home and as a showplace for his collection of tiles and prints. The first of three Mercer buildings in Doylestown, Fonthill served as a showplace for Mercer’s famed Moravian tiles that were produced during the American Arts & Crafts Movement. Designed by Mercer, the building is an eclectic mix of Medieval, Gothic, and Byzantine architectural styles, and is significant as an early example of poured reinforced concrete. It almost felt like I was visiting Europe when I was here.